Marc Andreyko has put our favorite she-devil through a lot during this five-issue miniseries from Dynamite. After sailing the seas in this reimagined "steampunk" alternative reality, Sonja gets enveloped in the dastardly plans of the mad scientist Victor Frankenstein. Yes, that Dr. Frankenstein. Our fearless heroine nearly escaped with her life after a gruesome shark attack so she's exhausted with only the help of a"frankenfied" version of Captain Nemo by her side. The series may have been light on the steampunk aspect, but there's been no shortage of action and adventure. The conclusion, Legenderry: Red Sonja #5, is no exception. You rarely see Red Sonja captured and at the mercy of a villain, but this is the circumstances she finds herself as Dr. Frankenstein prepares to unleash his genetically-altered man-beasts into the world. As usual Sonja uses her wits and strength to come on top but it doesn't come easy. One of the great things about the Red Sonja character is that she can transcend locations, time periods, even alternate realities. A relentless warrior unafraid to bust skulls, drink beer and bed men, Sonja's smarts and humor make her an irresistible hero to follow. It doesn't matter if she's a medieval barbarian or the captain of a pirate ship, Sonja is made for adventure. Andreyko smartly brings all these facets of the Sonja persona to light throughout the series. Even when the story takes dips at times it's her winning charm and resilience that keep the book afloat. Aneke's art has been consistently bold and energetic. The creative layouts and old-fashioned visible swooshing of movement lends perfectly to the throwback of swashbuckling pulp comics.In the finale issue especially there's a lot to take in as the cast of characters quadruples as the experiments of Dr. Frankenstein populate the story. Aneke balances detail where needed to the broader strokes for the background. The character designs are varied and Sonja herself has rarely looked this good. 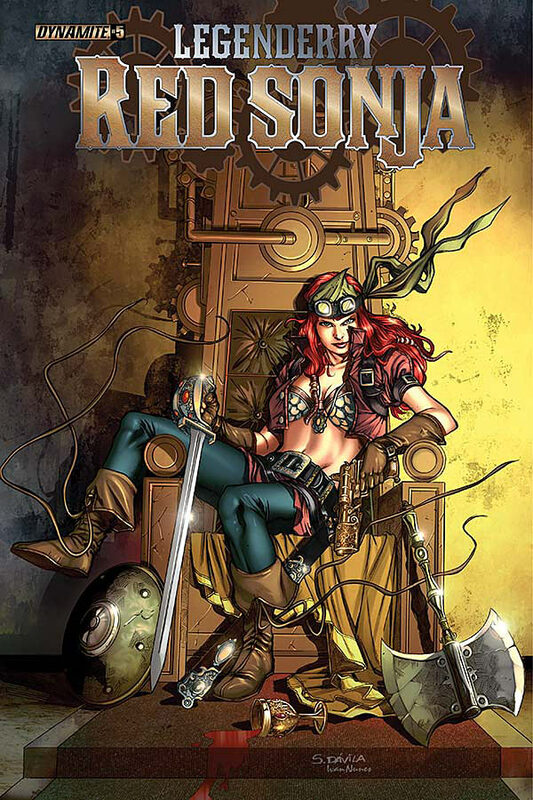 Legenderry: Red Sonja has been a wild kick in the pants for fans of pulpy adventure stories with mad scientists, monsters and fearless women. It's been a light-hearted affair made specifically to allow Sonja to shine. Andreyko and Aneke have added to the legend of the she-devil with a smart and fun miniseries.